dontdrinkandsew | You might spill your wine on the fabric! And that would be waste of good wine and good fabric. Slapped wrist, I haven’t written a blog post since November – eek! Richard has been doing a fair bit of travelling over the last three weeks, so I have had the most of the days and evenings to myself which means I have got quite a lot done. 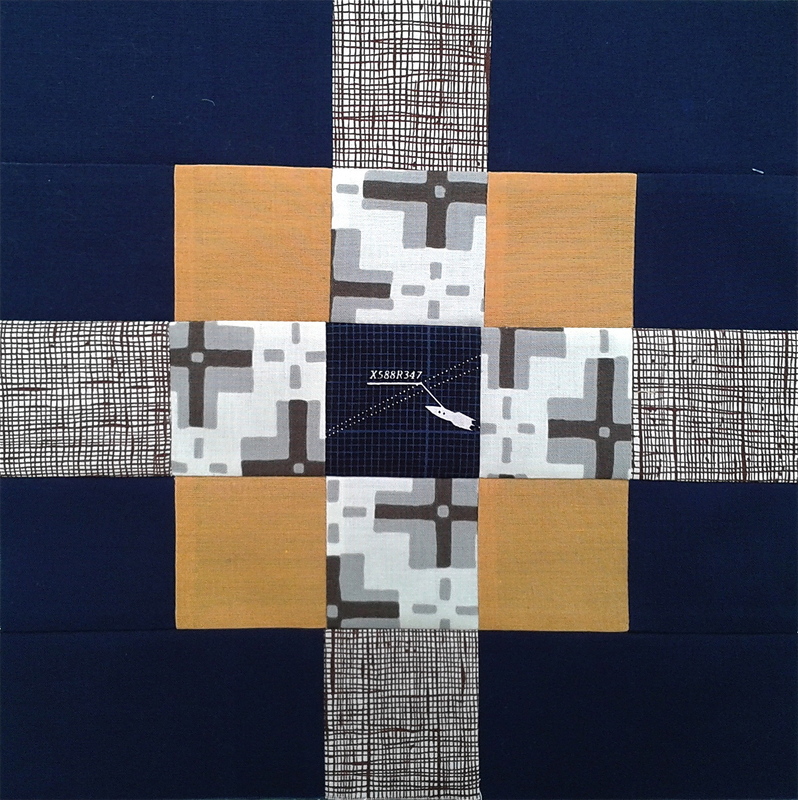 The block pattern is from Sewing by Moonlight. Personally I am not fond of paper templates, but I found that by using a little 505 spray on them it was easier to trim the quadrants down to size. You only need one triangle and one ‘kite’ for the middles. I literally sewed these together with no regard for pattern or colour and I really enjoyed the process. 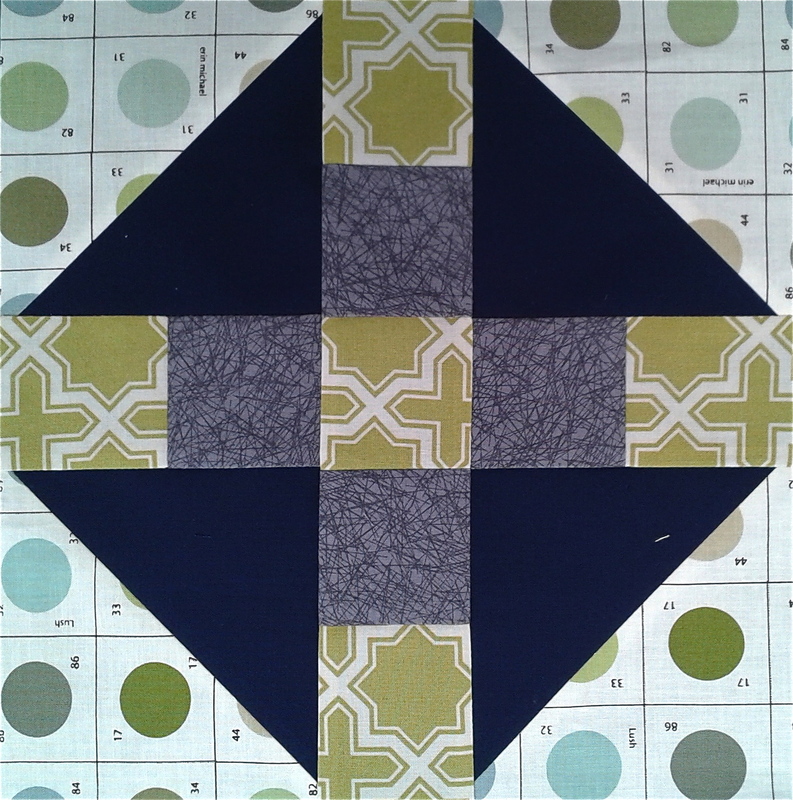 Suffice to say, I am not enjoying the quilting process – even on my new machine, but that’s nothing new for me! Pippa asked for some angel blocks for the Euro Siblings Together bee on IG, so I have been busy making these blocks as well for Cecilie in Denmark. These also finish at 10.5″ and are super easy to make. The only request was for all blue fabric. And then finally, Mary, Jo & Susy are doing another block drive to make more Siblings Together quilts in time for this summer’s camps. 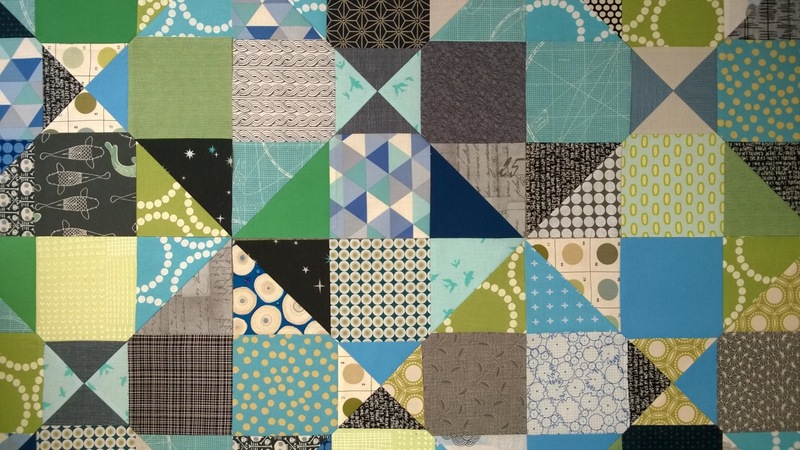 Last year they had over 200 blocks donated and made three gorgeous quilts for teenage boys. 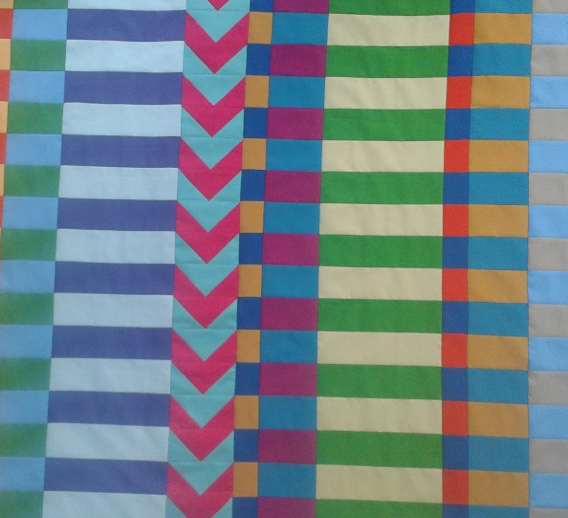 Below is a pic of Mary’s finished quilt. Linking up to Leanne & Nicky’s Scraptastic Tuesday (even though it’s Sunday)! Paying It Forward… Do you want me to make something for you? Back in October last year, I got lucky and managed to get onto the lovely Fiona‘s Pay It Forward list. I’m not sure how long the Pay It Forward thingy has been going, but someone had made Fiona a present and then she had a year to make a gift for three other people – me included as I managed to get in first as a commenter on her blog. Anyway, I had forgotten all about it. 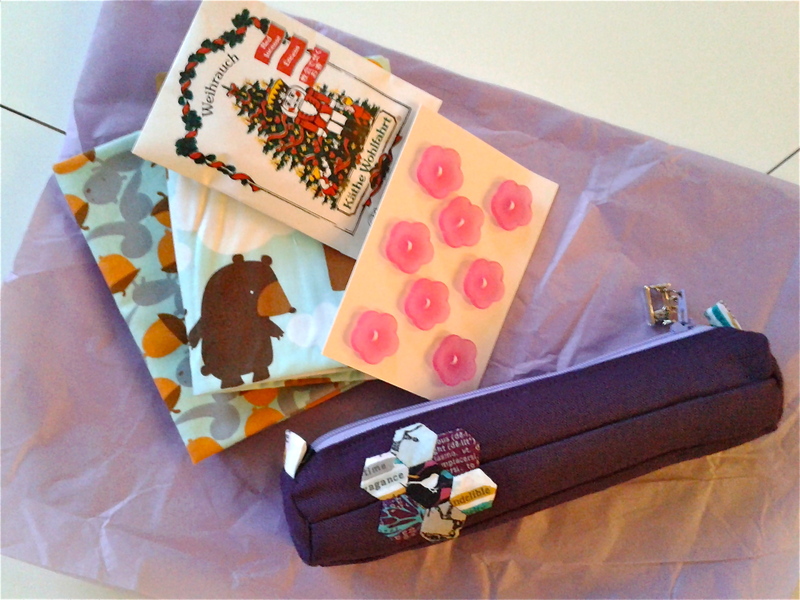 I got home yesterday with a tired boy and had a lovely parcel from Fiona with a beautiful pouch, fabric, pretty buttons, chocolate and Christmas incense – heaven! Oh and a lovely pen too! The pouch is very beautiful and made from deep purple linen and Indelible. But look at the teeny, tiny, hexies! I have no idea how she sewed these, but I love it 🙂 Thank you very much Fiona. This was a real treat to come home to. So, now it’s my turn to pay it forward to three people. So the first three people to comment on this post will receive some kind of handmade gift from me in the next year, after which it will be your turn to pay it forward. I’m happy to send internationally…so get to it! Two weeks ago the lovely Lysa Mair asked me if I would participate in the Around The World Blog Hop which is still going around the world! I agreed thinking it would give me a good excuse to write a blog post. Then everything in my house broke (plumbing diasters at every turn, I shan’t bore you with it all). So I am sorry for being late Lysa, but here it is nonetheless…. Nothing. A very simple answer. I appear to have temporarily lost my sewing mojo that is usually quite consistent while I have been attending to all the house stuff. I have made my bee blocks for this month and that is it. 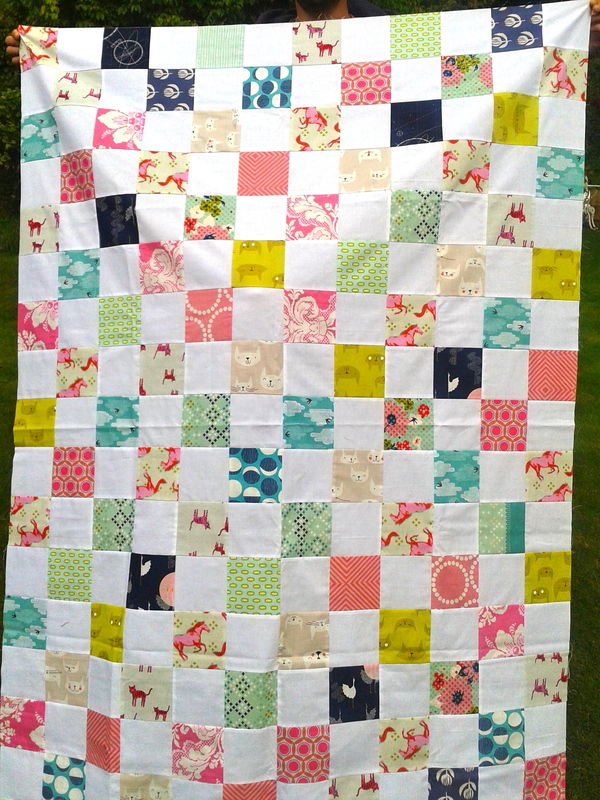 I was working on this quilt for a new baby girl that our friends’ were expecting in September. They have been living in San Francisco for two years and we knew they were planning on moving back to the UK, but I didn’t know they were expecting a baby. Fresh Pack Quilt. Free pattern available on Craftsy. Sadly they lost their daughter during delivery. Heartbreaking for them. I just can’t imagine how awful a time they must have had. Consequently, I had no heart for continuing with this quilt. I think eventually I will finish it and put it away until it’s needed again. I’m not sure it does! I am very random with what I choose to make and I definitely feel like I am still learning to sew and quilt. I love being in a bees as they often take me out of my comfort zone so I am forced to try new techniques or use colours that I wouldn’t ordinarily choose. Because I am a naturally creative type! It doesn’t matter what it is that I am making, but I have to make something or I get a bit restless! It could be a cake, new recipe or a quilt block, but it is something that appears to be hard-wired into me and always has been. 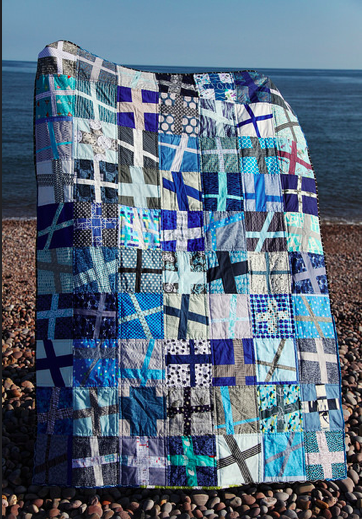 As far as quilt making is concerned, I stumbled upon it when I met a lovely friend through NCT whose mum had made her son some amazing quilts and it reignited my love of fabric design. 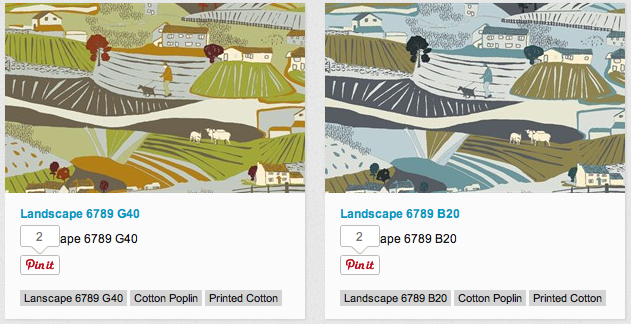 (I studied surface pattern design at uni, but have never worked in the industry. I was so skint after uni that I had to get a ‘proper’ job that actually paid some money.) My goal is to design fabric properly, commercially, but right now I’m concentrating on the small wins that sewing/quilting gives me and enjoying the lovely people that I have met through it. Hmmmm, normally it’s ‘can I make that?’ I don’t follow patterns terribly well. I am a very visual learner and normally I just try a few things and see if they look good. 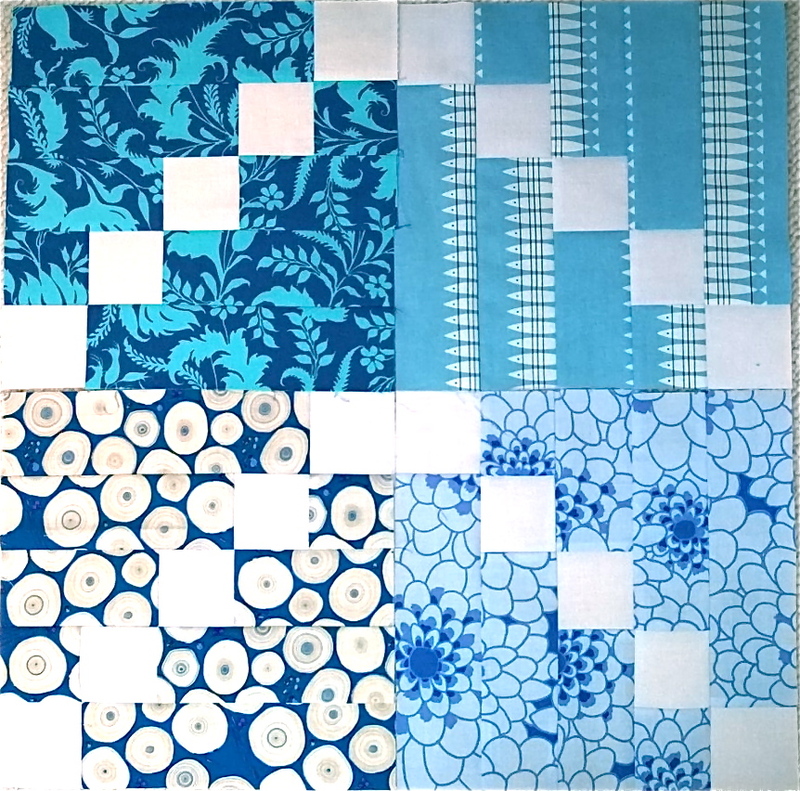 I never plan quilts on paper or choose all my fabrics before I start. It’s always a bit of a moving feast and not the most efficient way to make quilts, but that’s fine with me! I will now pass the baton on to Sue, who has lots more sewing experience than me and is much more organised!! I shall leave you with a clip from Bridesmaids. I would love to lose it like this one day and frankly have felt like this many times over the last two weeks, but to be fair, all of it was directed at my stupidly over-engineered Italian toilet, broken washing machine and central heating system. Enjoy! 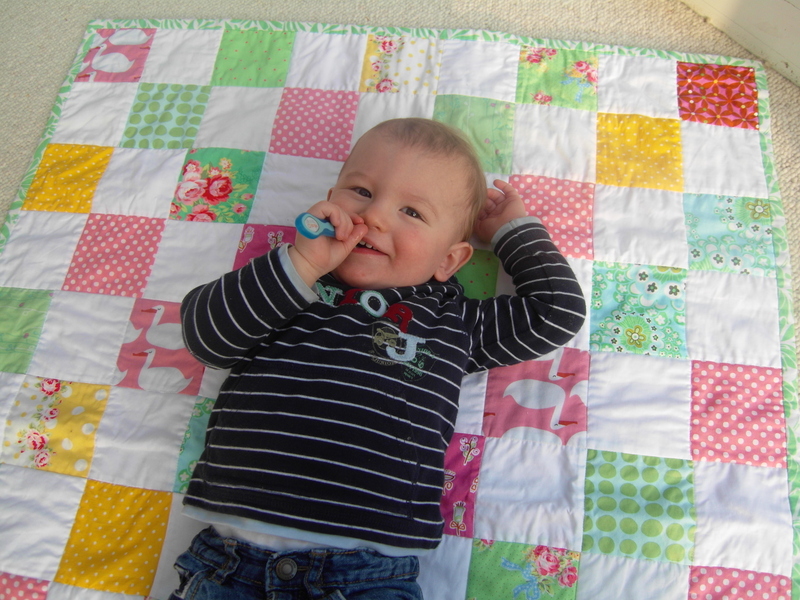 This is the second quilt I made (modelled by a very young Daniel). It was made for my husband’s goddaughter, Orla, for her fifth birthday present. To my delight, she abandoned her Barbie blanket in favour of the quilt and it has been everywhere with her since. I didn’t know how to make proper mitred binding then and my seam allowances left much to be desired, but still, she loved it and that’s the point isn’t it? It’s full of mainly cats with some horses and birds and some filler prints left over from other projects. 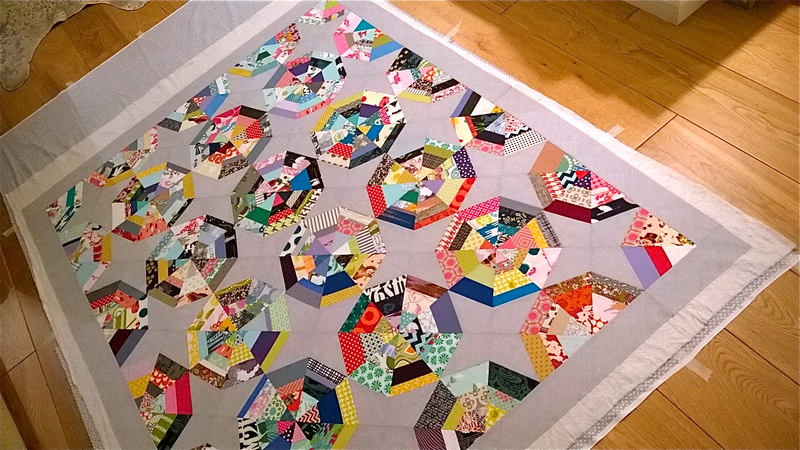 This week’s job is to piece the backing and quilt it – all the jobs I love most in the world…urgh. But, it means someone will actually have a quilt on their actual birthday. Wonders will never cease. It has been a sad week this week. Belinda lost her fight with cancer on Monday. I had word to prepare myself for her passing while we were away on holiday, but still, no matter how prepared you think you may be, it still hits hard, as sadly so many of us know, I’m sure. From left to right, Andrea, Nichi & Belinda at our wedding in 2004. I cannot begin to imagine how her family are coping right now. I can only be glad that I had the very good fortune to have her in my life while she was here and thankful for the friends who I have spent time with this week, who dropped everything to come over when I needed some company. Well, I hope you have all had a better week than me and I’d love to hear about it or see the second quilt you ever made 😉 When I have the balls, I might even show you the first one! This time of year always makes me feel sad for the summer that’s just gone. It’s that old back to school with a jumper that’s too big for you feeling, when you could see your breath at the bus stop in the morning…. Even though I dislike this time of year, I’m finding myself wanting things to get back to normal. The summer has flown by so fast, yet I’m hankering after some proper sewing time and Dan is so ready to go back to preschool. So, I didn’t get the job 😦 They sent me an email on Monday to say thank you, but no thank you! The hours I could work were not quite what they had in mind and although they were very complimentary, they think I’m a year too early to go back to work while I’m restricted by Dan’s preschool hours (9:15am – 2:45pm is pretty restrictive to be fair). Nothing else to report from here, except I saw The Grand Budapest Hotel film last week and loved it! Check out the trailer…. I have a second interview at Makower Fabrics today for a part-time job. 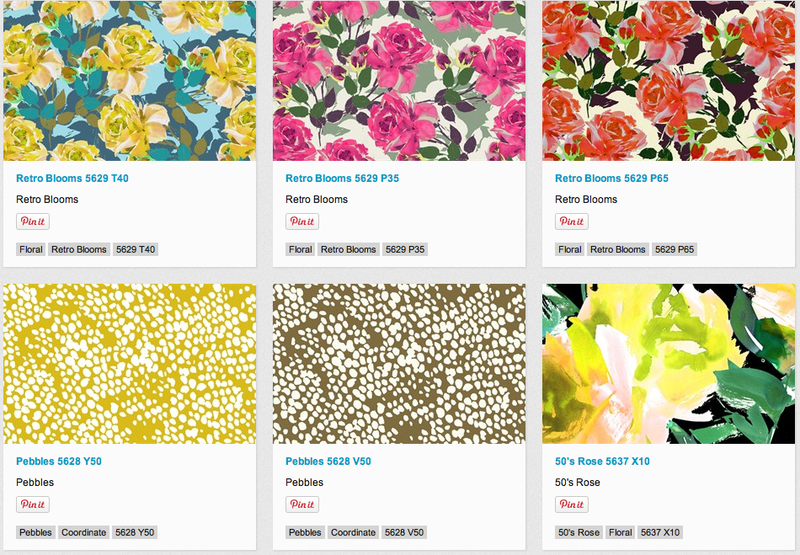 Not to be confused with Makower Quilting Fabrics, but confusingly they are located in the same building! Here are some of their prints, you may have seen them around. I shall let you know how I get on, but fingers crossed!